WASHINGTON — Earth's water may have originated from both asteroidal material and gas left over from the formation of the Sun, according to new research. The new finding could give scientists important insights about the development of other planets and their potential to support life. In a new study in the Journal of Geophysical Research: Planets, a journal of the American Geophysical Union, researchers propose a new theory to address the long-standing mystery of where Earth's water came from and how it got here. The new study challenges widely-accepted ideas about hydrogen in Earth's water by suggesting the element partially came from clouds of dust and gas remaining after the Sun's formation, called the solar nebula. Many scientists have historically supported a theory that all of Earth's water came from asteroids because of similarities between ocean water and water found on asteroids. The ratio of deuterium, a heavier hydrogen isotope, to normal hydrogen serves as a unique chemical signature of water sources. In the case of Earth's oceans, the deuterium-to-hydrogen ratio is close to what is found in asteroids. But the ocean may not be telling the entire story of Earth's hydrogen, according to the study's authors. "It's a bit of a blind spot in the community," said Steven Desch, a professor of astrophysics in the School of Earth and Space Exploration at Arizona State University in Tempe, Arizona and co-author of the new study, led by Peter Buseck, Regents' Professor in the School of Earth and Space Exploration and School of Molecular Sciences at Arizona State University. "When people measure the [deuterium-to-hydrogen] ratio in ocean water and they see that it is pretty close to what we see in asteroids, it was always easy to believe it all came from asteroids." More recent research suggests hydrogen in Earth's oceans does not represent hydrogen throughout the entire planet, the study's authors said. Samples of hydrogen from deep inside the Earth, close to the boundary between the core and mantle, have notably less deuterium, indicating this hydrogen may not have come from asteroids. Noble gases helium and neon, with isotopic signatures inherited from the solar nebula, have also been found in the Earth's mantle. 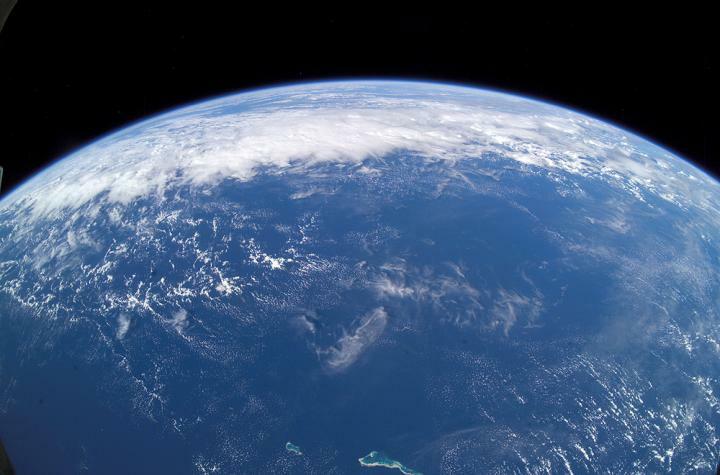 In the new study, researchers developed a new theoretical model of Earth's formation to explain these differences between hydrogen in Earth's oceans and at the core-mantle boundary as well as the presence of noble gases deep inside the planet. Through a process called isotopic fractionation, hydrogen was pulled towards the young Earth's center. Hydrogen, which is attracted to iron, was delivered to the core by the metal, while much of the heavier isotope, deuterium, remained in the magma which eventually cooled and became the mantle, according to the study's authors. Impacts from smaller embryos and other objects then continued to add water and overall mass until Earth reached its final size. The authors used the model to estimate how much hydrogen came from each source. They concluded most was asteroidal in origin, but some of Earth's water did come from the solar nebula. "For every 100 molecules of Earth's water, there are one or two coming from solar nebula," said Jun Wu, assistant research professor in the School of Molecular Sciences and School of Earth and Space Exploration at Arizona State University and lead author of the study. The study also offers scientists new perspectives about the development of other planets and their potential to support life, the authors said. Earth-like planets in other solar systems may not all have access to asteroids loaded with water. The new study suggests these exoplanets could have obtained water through their system's own solar nebula. "This paper is a very creative alternative to what is an old problem," Shahar said. "The authors have done a good job of estimating what these different fractionation factors would be without having the experiments." Journalists and PIOs may also request a copy of the final paper and multimedia by emailing Lauren Lipuma at [email protected] Please provide your name, the name of your publication, and your phone number. "Origin of Earth's Water: Chondritic Inheritance Plus Nebular Ingassing and Storage of Hydrogen in the Core"